There are very few turboprop planes that can fly a 1,000-mile nonstop trip. That’s about the distance from New York to southern Florida. Some can fly that many miles downwind, but when the wind is pushing against the aircraft, it’s nearly impossible. 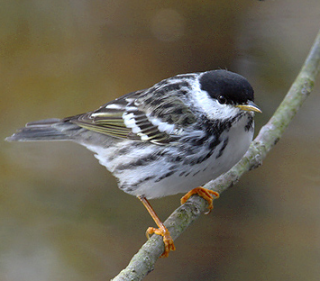 If that be the case, how is it possible that a Blackpoll Warbler (Setophaga striata) who weighs only 8 to 10 grams and measures somewhere around 5 inches is capable of accomplishing this feat and then some? That’s right, one of the world’s tiniest songbirds have been tracked according to a current scientific study to clock on upwards of 1,700 miles, over the Atlantic Ocean. As the focus of their Winter migration, from the Canadian Maritime Provinces, this species has been found landing as far south as Venezuela, Chile and even Argentina. 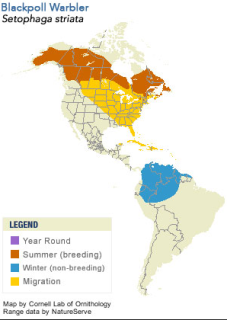 In fact, these migrations represent the southernmost records of any North American migrant warbler. “It is such a spectacular, astounding feat that this half-an-ounce bird can make what is obviously a perilous, highly risky journey over the open ocean,” said Chris Rimmer of the Vermont Center for Ecostudies, one of the authors. In the summer of 2013, scientists tagged 19 warblers. Then four, including two tagged in Vermont, departed between Sept. 25 and Oct. 21 and flew directly to the islands of Hispaniola or Puerto Rico in flights ranging from 49 to 73 hours. A fifth bird departed Cape Hatteras, North Carolina, and flew nearly 1,000 miles before landing in the Turks and Caicos before continuing on to South America. Given the hardships associated with these long-distance journeys, it is amazing that these creatures are one of the more abundant warblers seen in migration. Factors that contribute to its success include remote breeding areas undisturbed by man and no reliance on the cyclical populations of spruce budworm for breeding success. Even with these positive factors, it is still one of the miracles of the avian world for this tiny songbird to travel such long distances nonstop over water each year ~ and still have a song to sing once they finally arrive!